MOSCOW (AP) — Russian prosecutors moved Friday to block calls on social networks for more street protests in Moscow and other Russian cities following a wave of rallies that have cast a new challenge to the Kremlin. Tens of thousands demonstrators turned out in Moscow and other cities on Sunday to rally against official corruption in the largest outpouring of discontent in years. The Prosecutor General’s office confirmed Friday it has requested the state communications watchdog to block pages on social networks calling for more protests in Moscow and elsewhere in Russia coming Sunday. 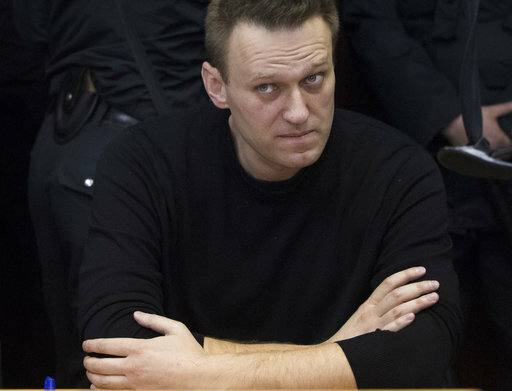 Russian opposition leader Alexei Navalny, who organized Sunday’s unsanctioned protest, is serving a 15-day sentence on charges of resisting police. More than 1,000 protesters have been arrested in Moscow, and many of them also have been sentenced to brief jail terms and fines. The U.S. and the EU have criticized the crackdown and urged Russia to release all detainees, but President Vladimir Putin has rejected the criticism as meddling in Russia’s internal affairs. Navalny has declared his intention to run for president and vowed to appeal a conviction that bars him from the race, which he denounced as politically-driven. Faced with a tough challenge, the Kremlin is mulling a response. Putin on Thursday vowed to fight corruption, but also warned that the government wouldn’t allow any breach of law. He drew parallels with the Arab Spring uprisings in Africa and the Middle East and protests in Ukraine that toppled a Russia-friendly president in 2014. “Everybody should act in political processes within the framework of the law. All those who go outside this law should bear punishment in accordance with Russian legislation,” Putin said. The protests have shaken Russia’s sleepy political scene and reinvigorated the opposition after years of relentless official crackdown, showing public readiness to brave draconian laws which make repeated participation in unsanctioned protests punishable with prison terms and hefty fines. In contrast with the past, when opposition demonstrations were mostly limited to Moscow and St. Petersburg, Sunday’s rallies engulfed dozens of provincial cities and towns. In another new phenomenon, the rallies also saw large attendance by school and university students. Peskov, speaking Friday in a conference call with reporters, said only that Putin is ready to listen to arguments by Sokurov and other cultural figures, but doesn’t always agree with their views.